In Spring 2014 HD Brows launched the Make Up by HD Brows make up range (click right image to enlarge). Developed by HD brows founder Nilam Holmes-Patel and celebrity make up artist Francesca Neill this 76 strong capsule collection of brow, eye, skin and lip essentials is the must have collection in every make-up bag! “Creating naturally beautiful looks and a flawless finish is what I am known for amongst my celebrity clients. Right from the start, we knew we wanted to create a capsule collection of high-quality, must have products that could create this, with a series of shades that would suit anyone. With Nilam’s brow expertise and my experience as a professional make-up artist, we really feel that we have created THE perfect range of brow, eye, skin and lip essentials that everyone can use”. 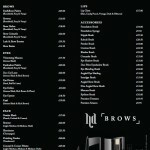 We have the full range of HD Brows colours and brushes for you to sample at our beauty studio for FREE. Then simply visit http://www.myhdbrows.com/ and use our unique stylist code which is B628 when placing your order and a FREE HD Brows make-up brush are delivered straight to your door. Easy!!! You will receive two e-mail notifications, one with your password (you can change this once you’ve logged in) and the second e-mail is entitling you to a FREE brush of your choice when you spend £35.00 or more. This luscious gel will groom your brows into shape using a lightweight, Vitamin E enriched formula. The delicate wand is tapered for the perfect application. Available in three colours to suit every client, Colourfix helps you keep that freshly tinted look between visits to the salon. With a new and improved formula, this wonder-serum includes the powerful peptide complex “Capixyl”, which stimulates the lash and brow follicles to increase their natural density and stimulate even greater hair growth. Apply twice a day for the best effect. Every palette includes an applicator and boasts two beautiful brow colours, as well as a carbon powder, highlighter powder and fixing wax – which can also be added to the powders to create a creamy eye shadow. Loved by celebrities, use this palette to create effortless day and night looks for the brow and eyes. An automatic brow pencil that is simple and effective to use. Roll up and apply the subtle colour to fill in those sparse areas to create perfect brows every day. Consisting of a durable waxy formula, with vitamins E & C to leave you looking and feeling good. This easy to use pencil creates a long-lasting colour that leaves your brows looking fuller and beautifully defined. A sharpener is included for simple on the go brow maintenance, perfect for those busy days! Available in 3 bendable tones, to suit all. Brush your brows into shape with this fabulous fixing serum, a hand bag essential to keep your brows looking great throughout the day…and the night!